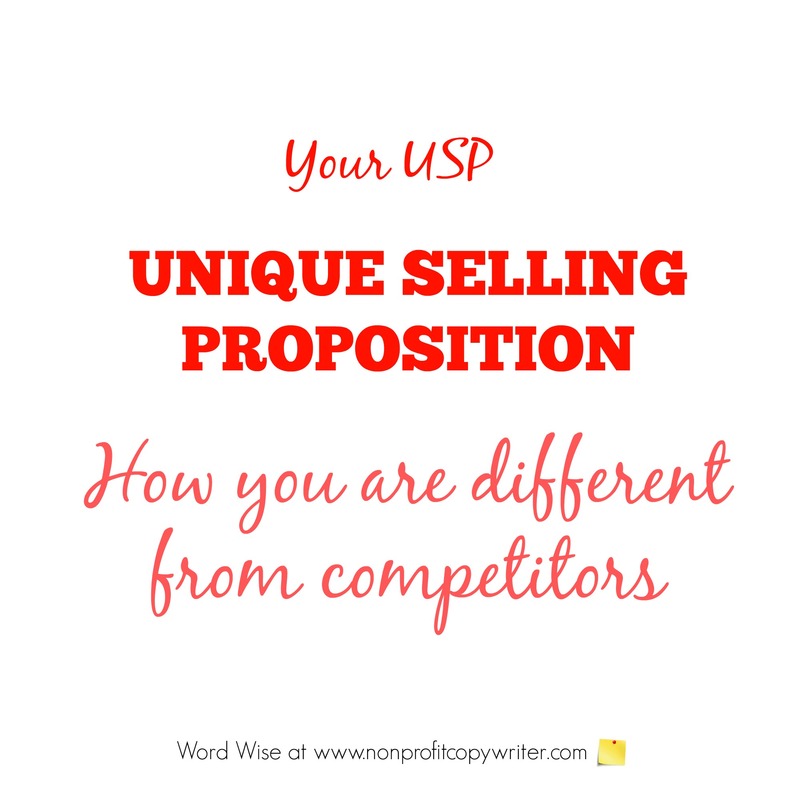 Your USP – Unique Selling Proposition – is what makes you different from other organizations. It's also sometimes called your "Competitive Advantage." Without realizing it, my client nailed THE most critical principle in successful promotion: identifying his USP. Today’s consumer is constantly bombarded with opportunities to plunk down his hard-earned cash. Why should he contribute to your client’s cause more than anyone else’s? Your client’s USP - his competitive advantage - distinguishes it from other groups – and shows that its services are the only one that fills a particular niche. With each new client, I ask a series of questions to get a sense of why his organization is so special. And it pays off. One client revealed that his group is the only vocational institution for impoverished Christian students in a particular Asian country. Armed with that information, we were able to set up a one-on-one sponsorship program, connecting individuals and churches to my client’s students overseas and opening up all kinds of new donor possibilities. Use the questionnaire below to help you compile a list of your client’s distinctives. Then, choose one or two of them – the most unique, overriding, compelling benefits – and you’ll have your client’s USP. Place it front and center in every piece of collateral material you produce for your client. But don’t toss the remaining benefits (such as special offers, secondary services and unique features). They are supporting players. Weave them in, too, into important fundraising appeals, on web pages, or in brochures, for example. 1. How is your organization different from your closest competition? 2. What additional services does your organization provide that others don’t? 3. What services are better through your organization? 4. What services are more effective through your organization? 5. Does your organization offer a competitive price/value for its services? 6. How does your service excel in quality? 7. What physical needs does your nonprofit meet? 8. What emotional and spiritual needs does your nonprofit meet? 9. How does your nonprofit meet those needs in a special way? 10. What specific/timely event(s) does your organization address? 11. Within a certain geographical radius, are you the only/among the few organizations that offer your type of product? 12. What particular age group, gender or income level finds appeal in your services? 13. What secondary demographic group finds appeal in your services? 14. In what ways are your donor care representatives known for their personal, courteous, go-the-extra mile service? 15. What kinds of contact methods do you offer (website, 24/7 hotline, toll-free number, e-mail, social media)? 16. Do you offer advice and technical support? 17. In what ways do you offer confidentiality? 18. How fast can you deliver information or answer an inquiry? 19. Do you offer a range of giving opportunities? 20. In what other ways do you excel in donor nurture? 21. Do you offer matching grants or other special giving incentives? 22. Are you known for unique, special premium gifts? 23. Do you offer additional opportunities for donors to support your organization, other than by financial gifts (volunteering, in-kind giving, prayer support)? 24. Do you offer value-added incentives (free information, newsletters, complimentary services)? 25. How do your staff members’ special skills make your organization more attractive? 26. How does your staff members’ unique training/experience enhance your organization? 27. How does their passion or excitement for your product augment your effectiveness? 28. How long have you successfully been in operation? 29. If you are new, how do you explain your success in such a short time? 30. What are your outcome statistics? 31. What are your donor satisfaction statistics? 32. What do clients and donors say about your organization? 33. Do you have any celebrity endorsements? 34. Is your product/service visionary in any way? 35. Are you on the forefront of a trend? 36. Do you find that your services are not duplicated elsewhere – or only in a cursory way? 37. Do you repeatedly develop new approaches and services to stay on the cutting edge? 38. In what ways is your mission a calling? Get more ideas on our Strategic Planning Tips Pinterest board.